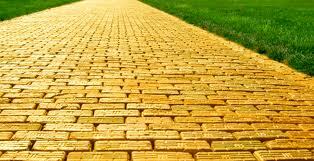 As a soul each of us has a purpose and our very own yellow brick road. The road I speak of is not a myth, story or movie yet not unlike the Wizard of Oz, it is the path we walk on this journey we call life. The path we walk is filled with joyful experiences, challenges, forks in the road and occasional road blocks to help us gain experience. It is the journey of a lifetime! Road blocks, challenges and forks in the road are there to help us heal and come back to ourselves and the path we chose before we took this human body. We are bound to meet untruths that are deeply hidden within our psyche and some of these we falsely believe to be our own truth. One of the biggest challenges is to find out which of our “beliefs” is really our truth or someone else’s. It is what we believe to be true about ourselves which causes us to make a mountain out of a small stepping stone. To help you uncover the false beliefs you hold imagine if the scarecrow, tin-man and lion are inside of and a part of you. You will run into these characters often as you skip down your yellow brick road and you may have noticed that every time you do, you momentarily stop your journey. The scarecrow represents your thoughts and intellect. The tin-man represents your identity and self-worth; And the lion represents your empowered self. The part of you that is certain, brave and courageous. Think about this character for a moment. He spent his whole life “thinking” he didn’t have a brain and wasn’t smart. He believed this so strongly it became his truth when in reality, it was someone else who once told him he wasn’t smart enough to do anything but scare away crows from the field. What beliefs do you hold that have kept you stuck in the corn field? Did someone once tell you, you weren’t smart enough or your grades weren’t good enough to carry out and fulfill your dreams? The thing I love about the scarecrow is that he stopped “thinking” and just started walking down the yellow brick road with Dorothy. He used his intuition to walk beside her with the faith and knowledge that he would find what he was seeking which, in the end, he discovered was already there. What “thoughts” of doubt creep in while you are walking your path? Do you over analyze everything? Are you seeking something which you already have or did someone once rain on your parade and tell you, you weren’t smart enough to accomplish your goals? How passionate the Tin-man for wanting a heart! Perhaps he believed he didn’t have one because he felt unworthy because he hadn’t done enough good deeds. Many believe they are un-lovable or at some level feel unworthy. They have difficulty loving themselves or lack passion because they are not recognized or identify self-worth with being loved by another. What do you believe about yourself? Do you love yourself and all that you are? Do you identify with someone else’s picture of what love is or think you don’t have love all around you and inside you? Your ability to love and your self-worth is not defined by your good deeds or giving to others although it’s very noble to do so. Sometimes the best thing to do is empty your head and allow the love in your heart to grow and grow until it surrounds you like a bubble. What you believe about yourself is what you show others unconsciously. If your belief is that you are separate, you will be separate. If you believe you are not worthy until…(you do this or that) you will spend a lifetime identifying with a very false belief. If you are seeking to find love outside of you, look inside first! Everyone encounters fear on their journey but when you truly believe in yourself and face your fears you have courage and bravery to move past them. You are stronger than you think! If you believe you will be defeated you certainly will be! If you let fear of failing in the past take over, you’ve just given over all your personal power to the fear. Fear is very real but how much of that fear is based in reality? Are you still afraid to ride a bike because when you first took off the training wheels you fell down and scraped your knee? No! You got back on that bike and continued riding down the road. Each time you face your fears and get back on the bike, so to speak, you empower yourself more and more. The path to self empowerment is to face your fears and obstacles and overcome them. Do not believe the voice in your head that says you are not strong enough, brave enough or courageous enough for that is the fear speaking. What you believe about your strength is what you give strength to! Next Post Count Your Blessings Not Your Stressings!